The SoCG logo is a figure in a paper by Joseph O'Rourke (the first Program/Conference chair of SoCG) which establishes that the minimum convex cover for a simple polygon might need to employ vertices that do not lie on the arrangement of lines induced by the extension of the edges of the polygon. 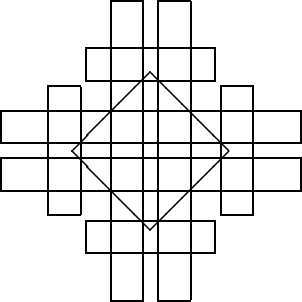 The central diamond covers the five gaps left by the union of the eight isothetic rectangles, but the diamond's four corners lie off the arrangement. "The complexity of computing minimum convex covers for polygons," Proc. 20th Allerton Conf. Commun. Control Comput. , 1982, pp. 75-84.